Bessel Vortex beams are propagation invariant in the linear regime and carry orbital angular momentum. We have experimentally investigated their filamentation regime with a novel approach of 3D direct reconstruction. These beams open interesting perspectives for laser processing and cylindrical laser compression. Tailoring ultrashort and ultraintense laser pulses provides unique controls on nonlinear propagation of light. This allows the development of very unique and novel degrees of freedom for femtosecond laser ablation and materials processing. My research is oriented on the use of so-called "nondiffracting beams" to control the propagation of light into dielectrics, light-plasma interaction and control in-depth material ablation. We have developed an expertise in beam shaping at micro-scale and high numerical aperture. Our techniques are mostly based on the use of Spatial Light Modulators (SLM). With phase modulation, we have developed shaping of Bessel beams and accelerating beams, which define focussing lines that are respectively straight and curved along the propagation direction. The focussing length overcomes many time the Rayleigh range of equivalent Gaussian beams. Femtosecond Bessel filaments exhibit exceptional properties at high intensities. Contrary to Gaussian beams which distort when propagating in dielectrics, Bessel filaments can show shape-preserving nonlinear propagation. We study in which conditions this occurs for Bessel and Bessel Vortex filaments. The shape-preserving propagation provides powerful tool to access the basics of light-plasma interaction. Diffraction free-beams provide unique ways for ultrafast laser ablation. We have reported for the first time single-shot, high aspect ratio (100:1) nanochannel drilling in glass. We have developed several novel laser processing techniques, including curved laser processing. Graphene is an interesting material for future technological applications. 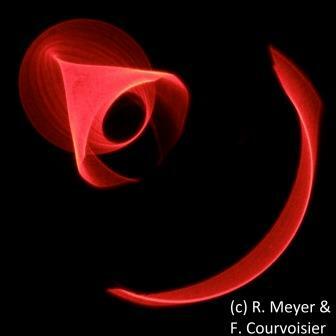 But in addition, it is a medium where we can study and control of 2D plasmas by shaped light.